Four thirty in the morning. That was our estimated arrival in Bandung in an overnight train from Yogyakarta. We booked a business class seats but were surprised with the train line’s definition of business class. In short, we had no decent sleep. Checking in to Ibis Bandung Pasteur at wee hours in the morning was our only request. Glad they accommodated us and found ourselves enjoying the soft beds before the sun hovers in Bandung. 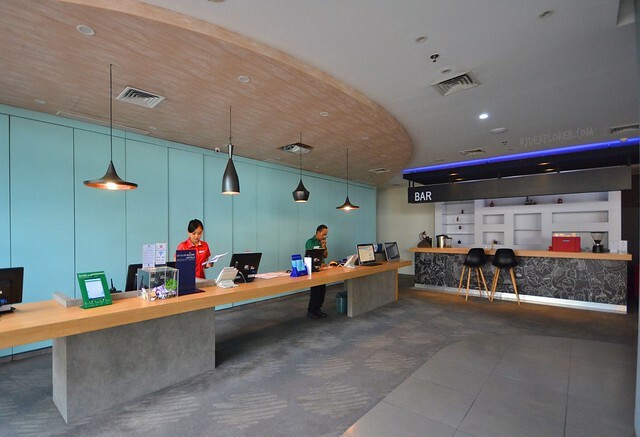 Ibis Bandung Pasteur’s front office. The lobby was a bit dim given that most guests were already in their dreamlands. The security helped us with our backpacks and woke his mate at the front-desk. Front-officer that time did his best for us to be billeted right away to catch a few hours of rest. After a tiring trip from Yogyakarta. We got a standard two single-bed room, one of the two room types available, another one is a double bed. 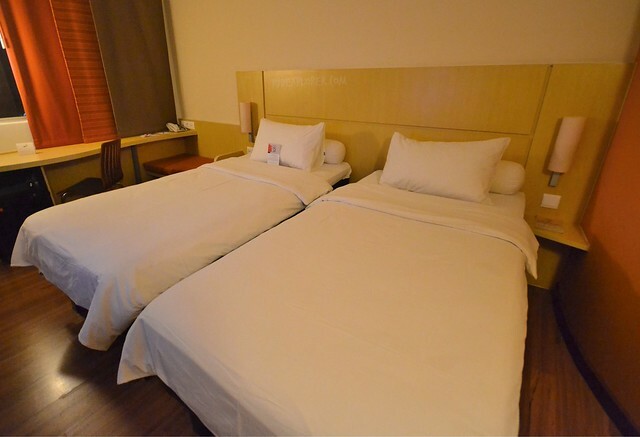 The room has two twin-sized beds hyped by quality Ibis beddings, a regular pillow and another bolster, a 32″ flat-screen satellite television, and a coffee and tea making facility. The working desk is near the window and business travelers staying in the rooms for some work-related stuff can enjoy high-speed WiFi. Each side of the beds has lamps helping the minimal lighting inside the room be cozier. Power outlets are Types C (or F) and G (used in Singapore). You need an adapter to fit with the power points if chargers of your gadgets are of different adapter. Pod concept for the toilet and shower. Toilet and shower have the pod concept, though the pod looks like tight, space is ample enough to move around. Hot and cold shower, shampoo and shower gel on wall-mounted dispenser, soap, dental kit, sanitary bag, and shower cap. All these shower amenities can be availed the moment you jump into the pod shower. 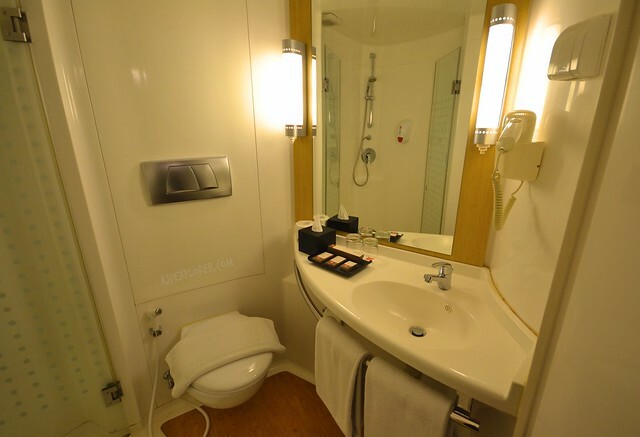 A bidet and a hairdryer are added conveniences. The hotel is under Accor Hotels and promotes environmental causes like planting a tree for the hotel’s energy savings. One way to help is to reuse your bath towels by simply hanging it on the section where a sign was placed. 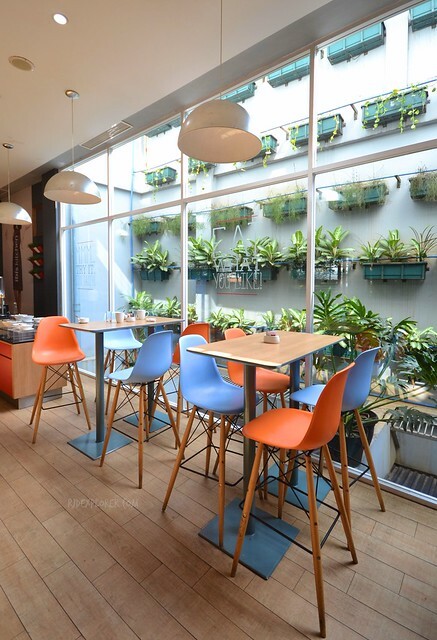 Your ticket to a bright day in Bandung. 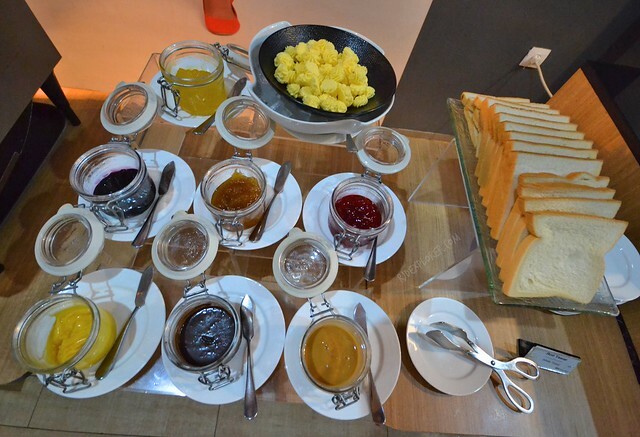 One of the things that I looked forward every day on our stay in Ibis Bandung Pasteur is the breakfast at Ibis Kitchen. 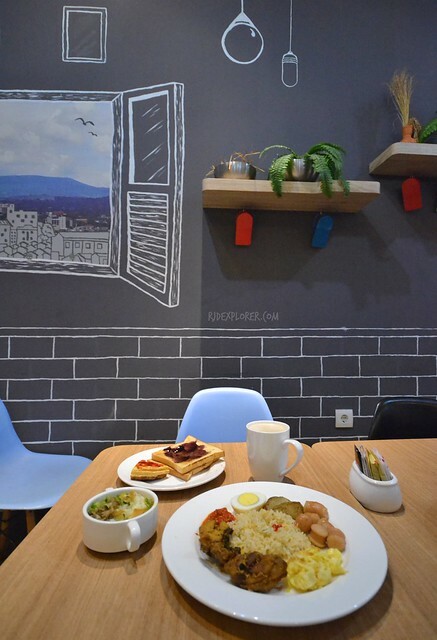 The place provides delightful and filling meals perfect for an energy recharge before exploring Bandung’s tourist attractions. 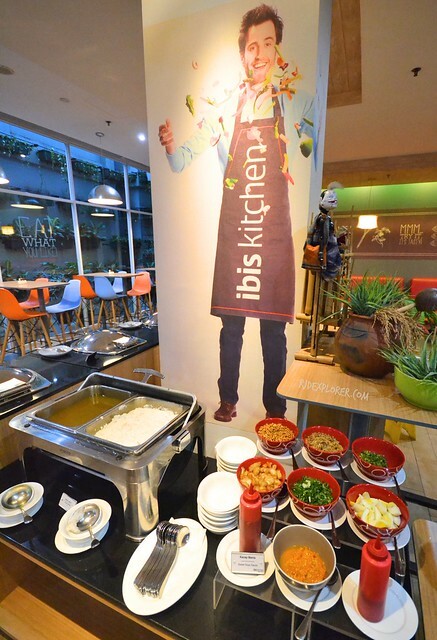 Ibis Kitchen has two serving times: for the early risers and the regular buffet that starts from 6:30 until 10. But on the three chances we had, we always avail the later schedule. Bubur Ayam, one of my morning staples at Ibis Kitchen. 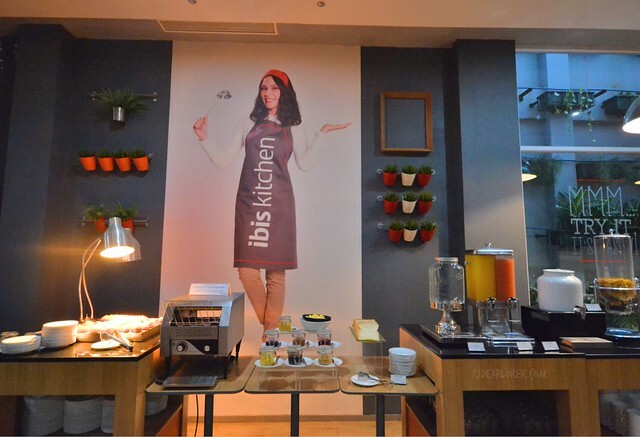 Ibis Kitchen, to cater both international and local travelers, combines the elements of continental flavors with local staples. Before enumerating the buffet spreads, I would like to describe the swanky and stylish restaurant. It has two dining areas with the other one catering larger groups. There’s a floor-to-ceiling window that allows natural day light to brighten every morning at the café. What’s more to that are pots on the wall flourishing with plants. Tables and chairs are also fancy similar to the walls that were hyped to create perfect dining ambience. 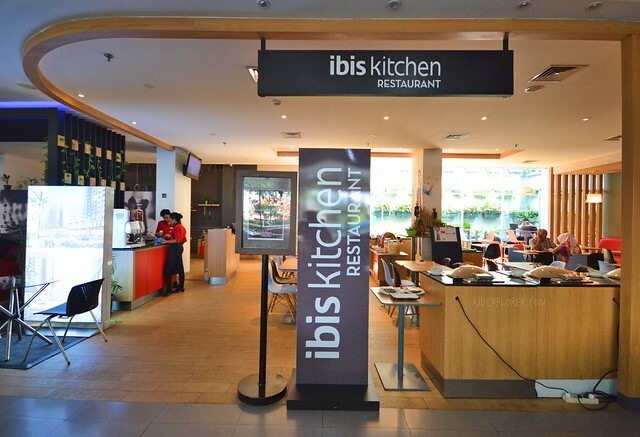 Ibis Kitchen has three major sections, excluding the coffee vending machine for a dose of black coffee or cappuccino. Nearest from the entrance offers the local staples like fried rice and meat. On one side of the middle spread extends the local section with a bowl of bubur ayam, or chicken congee. Other sides have sautéed mixed sausages, fried potato wedges, boiled eggs, and fruits. 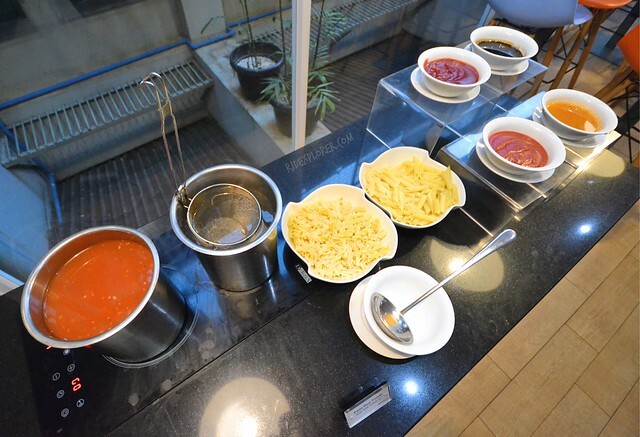 Last segment has the do-it-yourself pasta, cereal, juice dispensers, bread and a dozen of spreads, and pancakes and pastries. 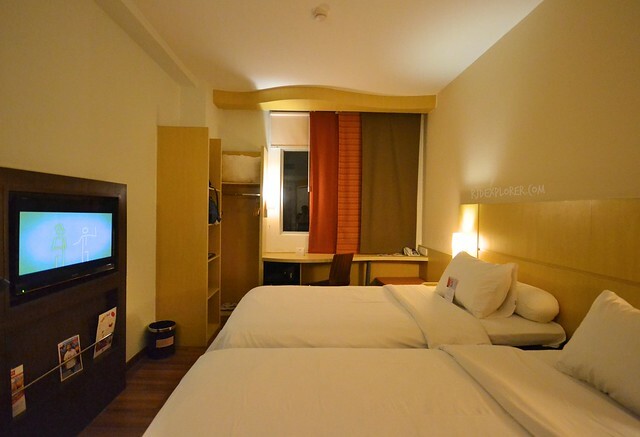 Location wise, Ibis Bandung Pasteur is around 3 kilometers from Bandung Station while only a kilometer away from Paris Van Java. If you have plans to visit Bandung attractions like Floating Market and Farmhouse in Lembang, you can easily book via Grab. The hotel has a Grab app on the front-desk and the staff can assist you in getting one. If you’re keen to experience the angkots, local transport in the city, and city buses, the crew are helpful as well to give you the instructions in reaching your destination. 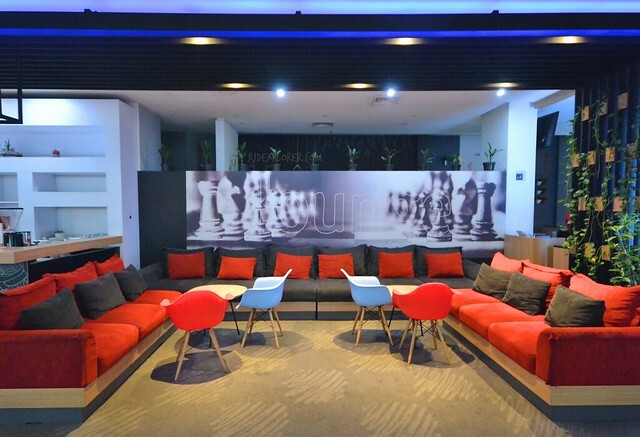 With the modern facilities and amenities available at the hotel, Ibis Bandung Pasteur it’s surprising to see the rates offered by the hotel. It’s one of the affordable places in Bandung but compared to other properties, the hotel provides more than what you’ve paid for. 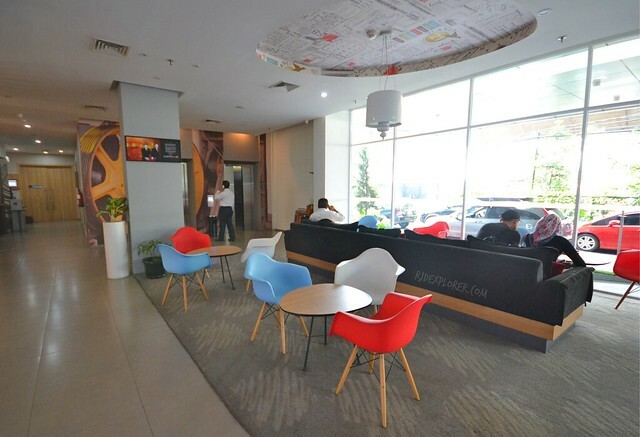 Overall, apart from the filling daily breakfast, a comfortable stay and helpful hotel crew will be your treats when you make your way to Ibis Bandung Pasteur on your visit to Bandung, Indonesia.